FiddlersWreck play as a three or four piece ceilidh band and are based in York featuring Nicky Kerslake (fiddle), Marie Wood (accordion), Michael Jary (caller & concertina), Paul Young (melodeon, guitar and fiddle), David Hammond (piano and cello), Abi Sutton (fiddle) and Nina Zagorski (piano) to give you all the drive you need to make your feet want to dance. 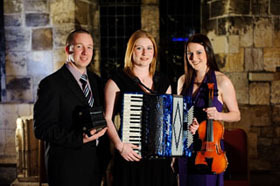 The band formed in 2005 and has now built up a well respected name in the ceilidh band circuit. Michael will explain everything you need to know to dance with plenty of easy and fun dances for complete novices upwards plus a few more complex dances for more experienced dancers. We cater for any type of function, Birthdays, Weddings, Parties, Burns Nights, New Years Eve, church and work socials, fundraisers etc and for any number of dancers from 40 to 400+. Should your function have any particular requirements then please do not hesitate to contact us. In particular we are able to provide a smaller band for certain shorter or smaller events on a budget.